I had a little nearly mid-winter treat last night – YD and her friend, tLK and I went out to dinner at a beautiful and historic old pub about 15 minutes from town in a little bay just past the big industrial wharf of Port Chalmers. YD had somehow scored herself – and us – a free bottle of Riverstone Sauvignon Blanc to accompany the meal. None of us had been there for years – the last time I went was to have lunch with a couple of friends in the garden of the pub. The food was okay and the service slow, but seated at the next table over were Cleo Laine and Johnny Dankworth and we spent the entire lunch admiring and eaves-dropping and wishing she would just up and sing……….. but as it was only us and them, that never happened. Since then the pub has undergone a transformation – the garden is now covered in and heated by huge gas heaters and you can dine in it even in the middle of winter. The service is a million times better and the food has upped its game a gizillion fold since Cleo and Johnny sat in the garden with their fried cheese sandwiches and bottle of best NZ Pinot Noir – I told you we eaves-dropped! The reason we were heading for Carey’s Bay was the seafood. The pub is famous for it. But, like I said, none of us had actually been there for a long time. There had been a lot of discussion prior to the event on whether the fish platter was an actual platter or a basket – YD being set on having the platter – so it was relief all round when she announced during the drive that it was indeed a platter as she had checked on line. YD has an absolute fetish about fish platters. I think she has tried most of the platters available in restaurants both locally and nationally – and even in parts of England and Australia. She likes New Zealand fish the most and locally caught fish best of all. YD likes fish. She especially likes fish platters. Fish baskets, not so much. Personally, I didn’t care nearly so much, it was just such a treat to go to this lovely old pub with these two lovelies and have a good meal and share a [free] bottle of wine. We arrived and parked in front of the hotel, right on the waters edge. The night was calm and almost mild. The lights twinkled beguilingly on the water and the waves lapped at the moorings of the fishing boats. The stone pub stood stolidly on its ground, through the lit windows fires sparked and patrons sat in groups talking quietly over their drinks or meals. Two elderly ladies sat by themselves in the smallest bar, at a small table right in front of a roaring open fire. A large, heavy silver teapot sat on the table between them as they talked earnestly together. They were still there when we left………. We took our seats in the enclosed garden restaurant close to a roaring gas heater and entered into a complex discussion on whether to have the fish platter or some other offering. 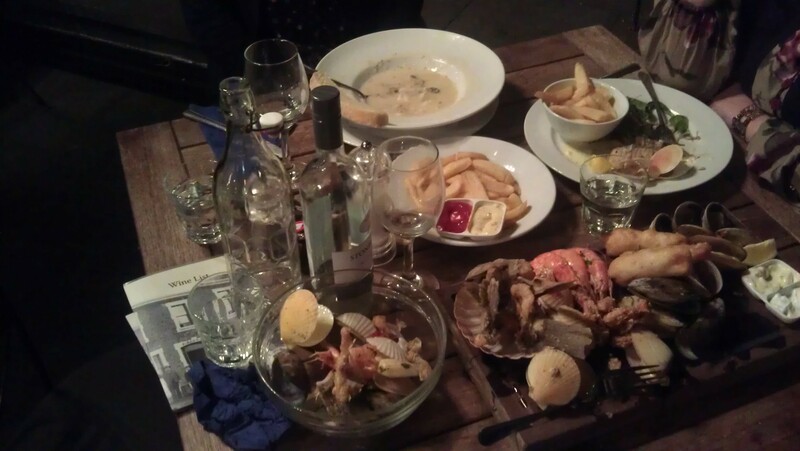 Eventually it was decided that we would indulge in a small shared entree, a selection of delicacies available as mains. In this way, other tastes might be sampled and the fish platter still be loyally adhered to. When the entree arrived it looked to be enough to feed us all adequately with no need for anything else. But we had already ordered our main courses………. The selection was delicious and we took our time over it, sipping on our wine and swapping stories of our doings since last we had all met. Eventually the main courses were carried out. I say carried, but really the server needed a horse and cart to get it to us and we needed a much larger table to accommodate it! There were gasps all round and cries of both wonder and horror conjoined – tLK and I shared many theories on how YD would manage her platter – and even YD, it must be said, looked somewhat stunned for a few moments. In the background is tLK’s seafood broth and the Contented Crafter’s fish of the day and salad with a bowl of fries on the side. The rest all belongs to YD. YD pretty much ate all of it! YD is 5’9′ tall and 140ibs. If you are in this neck of the woods, take a trip out to Port and on to Carey’s Bay Pub. You won’t be sorry – but share the fish platter with someone you love. 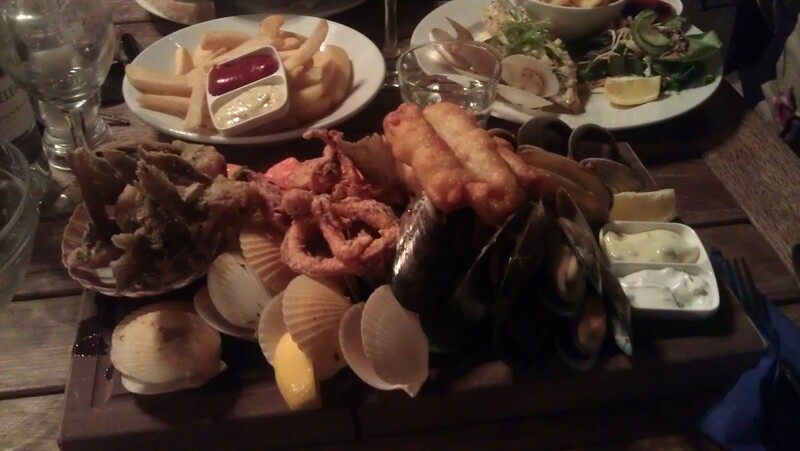 This entry was posted in Daily Life and tagged Carey's Bay, Cleo Laine, England, Fish, fish platter, Food, Gas heater, New Zealand, NZ, Port Chalmers, Seafood by thecontentedcrafter. Bookmark the permalink. It’s 12:35am here and now I am starving after reading your post. I must stop reading your delicious looking food posts when I should be concentrating on sleeping. I’m glad you had a great time! Aww – chuckle!! I’m sorry!! ‘Night, ‘night PLGCM!! I’m glad you popped in though…. I’ve always wanted to go to a seafood only restaurant! This looks great! It is a truly lovely dining experience – but they do have a few non-fish offerings on the menu too, just in case I suppose………… I’m sorry that I didn’t take my camera and get a couple of shots of the dining area itself as it is quite unique for this part of the world. [We only had YD’s phone camera to hand…….] Thanks so much for dropping by, it’s lovely to meet you!